After a busy summer filled with business, law, and medical summits at Georgetown University, Leadership Initiatives is ready to get back to work on its main project: the International Business Internship Program (IBIP). Due to the hard work and monumental success of these summer programs, Leadership Initiatives has been able to recruit more students than ever to become a part of IBIP and help change the lives of business partners across the globe. This week marks the first official week of the 2018-2019 IBIP year; new teams have been meeting with their mentors and business partners for the first time, making introductions and preparing for their exciting year. Moreover, successful IBIP groups from previous years have come back together with even more ideas and solutions for their business partners, cementing and furthering those relationships with their associates and translators that were already so strong before the summer. Leadership Initiatives is thrilled to be working with so many talented students this year, and we wish great prosperity to all of the new teams! These first meetings have gone extremely well. As mentioned above, new teams have officially begun calling their business partners and discussing what problems they would like to tackle together. Callie’s team from Ridgefield High School is just one example of the bonds that can form between these young innovators and businesses on the other side of the planet. In a letter to Leadership Initiatives about their first call with Grace, a salon owner in Nigeria, Calli writes, “The first time we met Grace with our translator Tamar, the entire Skype call was full of smiles and laughs that warmed our hearts and managed to bring us closer in just 30 minutes!” Relationships likes these are forming across the nation, allowing both the students and the businesses to trust one another and create a strong foundation for the rest of the year. Callie’s team and Grace have decided to begin collaborating on designs for Grace’s renovation of her salon, showing the impact that these students can have on many aspects of a business and its success. Teams like the one above are why Leadership Initiatives was created: to help people around the world with their most pressing issues, offering ideas and insights from disparate perspectives for the purpose of finding those monumental solutions. Leadership Initiatives was created for this spreading of ideas and knowledge, something that has helped transform businesses year after year. I would like to personally thank you again for your donations to Leadership Initiatives. Without the aid of our phenomenal donors, it wouldn’t have been possible for students like Callie to meet Grace. Through your donations, you make it possible for the solutions of students to be turned into realities for our business partners. Leadership Initiatives relies on the benevolence of donors like you, and we thank you for your involvement and participation in our work to better lives! You, along with the students in our IBIP teams, help make a difference in the lives of businesses like Grace’s and many more! If you would like more information about any IBIP team’s work, including that of Callie’s, please visit liempower.org. Helping Auto Repair Shop Prosper! Today has marked the beginning of the first YDP summer program for 2018! We have a great group of students ready to learn and do amazing things in our Law program. Therefore, Leadership Initiatives would like to thank all of our supporters and students for making this experience possible. We could not do it without you. "My experience with Leadership Initiatives all started at the Global Young Innovators Initiatives summer program. 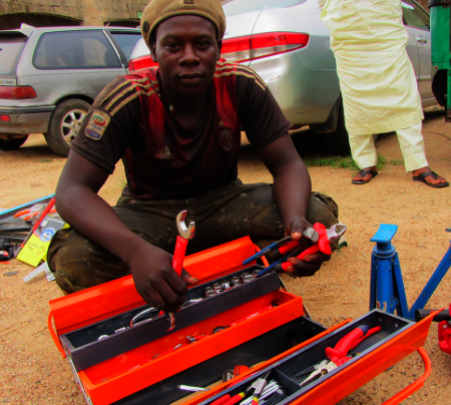 Before I attended this program, I couldn’t imagine that I would be working with an auto repair business located in Bauchi State, Nigeria, a town that has been attacked by Boko Haram. As a 16 year old kid who failed my only attempt to change a tire, I could not imagine I would be giving auto repair advice to Faisal Sa’ad, a man who had been working in this field his whole life. Not only was I able to give him advice, but my innovative solutions actually became a reality for my business partner. From this, I was invited to lead a team for International Business Internship Program (IBIP), that uses first-world students with easy access to technology to make a difference across the globe. Upon accepting the invitation, I agreed to create a team willing to make a two-year commitment. Over the last year, our team has given instructions on timing belt replacement, inserting the stabilizer linkage, and inserting the driving shaft. In addition, we helped the business maximize profits, create a logo, and proposed advertising. My team has been able to improve Faisal’s business, and I hope that I can keep helping him grow his business even more in the future." From these student solutions, we are able to create change in a vast amount of businesses located in Nigeria. This empowerment of businesses increases the infrastructure of the area and helps develop the city to prosper with the business owners acting as community leaders. If we are the catalyst to grow these businesses then they are able to help other individuals in their community by offering them a paying job or appointing apprentices. I would like to thank our supporters again, because we could truly not make this happen without your support for us and for what we stand for. Your generosity is greatly appreciated and is going to help make international change in Nigeria. Thank you again! The high school summer programs are coming up very soon, and we at Leadership Initiatives are so excited to see the outstanding solutions created by some of the best students across the nation. However, the real takeaway from our programs is not only the student's success, but the lives that are changed forever, especially in the International Leadership and Business Summit. From the solutions created, Nigerian business owners are able to help their community positively by empowering others, taking in orphans, and providing jobs for those who need it. Although the benefits for the community are exponential, the growth of the business from these solutions allow the business owners to gain more education and the knowledge to strengthen their career and passions. One specific business owner, Rabi runs a catering business in Bauchi, Nigeria. She lives with her family and works hard at cooking and making pasteries to support herself and the family. However, her goal is to eventually go back to school and get a degree in a science-major. Before Rabi goes back to school herself, she wants to give her sister the opportunity to go to university first with her support. This selfless act shows how Rabi truly deserves the best in her company and life. She is dedicated to helping those around her being the best that they can be before helping herself. That is why it is so important that we help these remarkable individuals so they can acheive their dreams and provide a better future for the next generation. Your contribution is not only impacting one life - it is working towards empowering a community that does not have the same priviledges as some of us. If we give individuals the tools that they need to succeed, they will thrive and beget more change in their community. Thank you so much for your generosity in helping us continue our mission to empower business men and women globally. Your support means the world to us and those who you are directly helping. By your contributions, you are allowing people like Rabi to attend university and gain a valuable education. We can make a difference together by helping those individuals in developing countries to gain valuable knowledge to help them suceed even further. I thank you again for joining us on this journey!